My wife Margaret met John Sidney in Hobart (early 1940s) whilst a dance in "Patches" - when John played violin in the local concerts. He was later to teach himself piano and organ. I first met margaret in 1978 in Melbourne and later when visiting (1980) Hobart and walking through the Wrest Point Casino I heard this great piano sound: mind you, coming froma small Yamaha upright. I stopped, listened, quite astonished, as one rarely hears the piano being used as intended; being played so enthusiastically and with such aplomb. My being a traditionalist: from Beethoven Sonatas to Fats Waller solos - I was pleasantly surprised to once again hear that tradition (once described as "two-fisted piano") live!! I expressed to John my views at the time: a mutual concurrance. John is well known and admired as a popular entertainer: with 'Charlie'; Hammond organ and piano various. 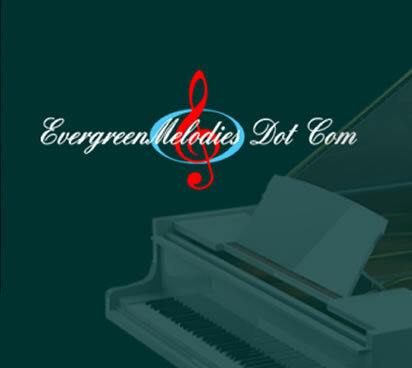 He has kept up the repertoire of the popular piano classics, equipping his craft with every known song from the Sing-A-longs through the Evergreens to the Show-stoppers. 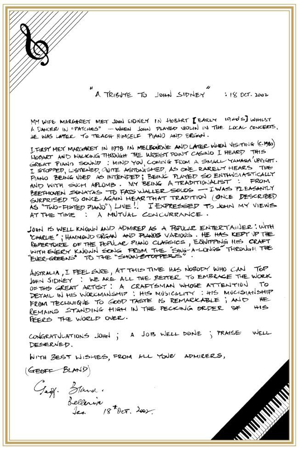 Australia, I feel sure, at this time has nobody who can top John Sidney: we are all the better to embrace the work of this great artist: a craftsman whose attention to detail in his workmanship: his musicality: his musicianship from technique to good taste is remarkable; and he remains standing high in the pecking order of his peers the world over. Congratulations John; a job well done; praise well deserved.